Jenny Quantum (also known as Jenny Quarx) is a fictional character, a comic book superhero in the Wildstorm Universe published by DC Comics. She first appeared as a child in The Authority #13 (May 2000), and was created by Mark Millar and Frank Quitely. She first appeared as a teenager in Authority: Revolution #7 (June 2005), and was developed by Ed Brubaker and Dustin Nguyen. Jenny Quantum was born January 1, 2000 in Singapore, during the death of Jenny Sparks, where her birth mother was killed by super villains attempting to kidnap her and shape the coming century. Her biological father’s identity and whereabouts are unknown. She was rescued and cared for by the Authority and later adopted by Apollo and Midnighter shortly after their marriage. She is the current leader of superhero team, The Authority. Jenny first appeared in The Authority #13 as a child and Authority: Revolution #7 as a teenager. Quantum is the corporeal Spirit of the 21st Century, and the youngest known Century Baby, as well as being the successor to the Spirit of the 20th Century, Jenny Sparks. In the "Fractured World" storyline (issues #10-#13 of the second volume of The Authority), it is revealed that Jenny Quantum had a twin sister. It was believed that there were no other survivors. Jenny's twin sister had been found unharmed in the ruins of the Singapore hospital by the Chinese government, who recognised the potential weapon that she could become. She was immersed in a cruel assassination program that involved hyper-learning, as well as ways to kill and wage war. She was named Jenny Fractal after it was realised that she could tear reality apart at the seams. Fractal escaped, causing a series of fractures in the fabric of reality. She forced the government to help her, on pain of total annihilation; she was able to convince the Authority that she was Jenny Quantum's biological mother. She was on the Carrier when another series of fractures led to the near-destruction of many cities. The two Jennys battled it out; Apollo was nearly killed while the others were trying to control the damage on Earth. Fractal was able to seize control of the Carrier after killing Jenny. In a bid to bring her back to life, the Doctor captured her spirit at the moment she died, temporarily placing her in the Garden of Ancestral Memory. The Authority went back in time to the birth of the twins, where Midnighter was sent to kill baby Fractal. The Authority took on Fractal, who had followed them back in time, to distract her. After the baby's death, the Doctor helped Jenny's spirit return to the other body. Because both of them were the reincarnation of Jenny Sparks and identical twins, when one died, the other would have become the sole spirit of the 21st century. Since Fractal's consciousness was not captured at the time of her death, Jenny's was able to transfer to her body. In Authority: Revolution #7, Quantum forced herself to age several years into her teens so that she could better fight the threat of Henry Bendix and his evil group. While fighting Bendix, Jenny was able to free the current Doctor, Habib Ben Hassan, and enlist him in the fight against Bendix. In Captain Atom: Armageddon #9, Captain Atom inadvertently kills Jenny Quantum when she attempts to quiet the energy build-up within him that is about to destroy the universe. However, promotional artwork for the new Morrison/Ha version of The Authority show Jenny Quantum, now renamed as Jenny Quarx, standing in the middle of the poster as the leader of the new Authority, which also appears to have the same line-up as the previous version. 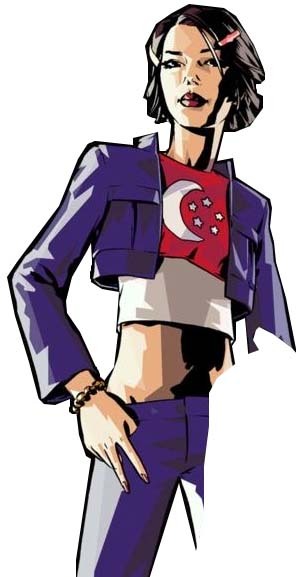 Quantum/Quarx is wearing a t-shirt with the Singaporean flag, in a manner reminiscent of Jenny Sparks' Union Jack t-shirts. In summer and autumn 2008, Wildstorm produced an eight-issue limited series, Number of the Beast, documenting the destruction of the Wildstorm earth by a resurrected John Cumberland of The Changers. During the series Jenny sacrificed herself to prevent the Carrier's engine, a caged miniature universe, from overwriting and destroying the universe when the damaged Carrier crashed to earth. Before absorbing the universe she kissed goodbye to The Doctor, telling him that should she return he should find her and tell her how it all turned out. After Number of the Beast a new Authority series by Dan Abnett and Andy Lanning, Authority: World's End, depicted a post-apocalyptic world from which Jenny was (at least initially) absent. In 2011, a new version of Jenny was created as part of DC's revamping of their entire comic line. She makes her first appearance in Stormwatch vol. 4, #1 (September 2011), as a member of that group. This version is a pre-teen and is being mentored by Adam One, a character who has apparently done the same for hundreds of Century Babies. In the first issue her full name is stated to be Jennifer Emily Quantum, and her powers are based on "21st century physics, whatever those turn out to be", leading Adam to state she can try just about anything she wants to at the moment. The fifth issue reveals that her father, a general, believes she died in a terrorist attack. When she comes of age, like all Century Babies, she will become leader of Stormwatch. DC editorial later abandoned its revamped Stormwatch, and Paul Cornell introduced a new variation on the team with issue #19 (March 2013), with Apollo, Midnighter and Engineer restored to their original characterisations and designs. Jenny Quantum is entirely replaced by the character Jenny Soul, an adult English telepath with emerging telekinetic abilities. Due to her young age, Jenny's powers have not been fully defined. As a newborn she produced an energy blast of sufficient strength to disintegrate the legs of a giant who was attempting to kill her, along with devastating a significant portion of Singapore. Inspired by the Doctor's Garden of Ancestral Memory, Jenny created a dimension for all her ancestors called the Infinite City, a metropolis of assorted time-periods on the back of a giant turtle. Jenny Quantum's lineage extends to the earliest accounts of human history, which include Jenny Stone and Jenny Fire, the first two "Century Spirits". Her direct ancestors before Jenny Sparks are Jenny Steam, Jenny Revolution, Jenny Plague and Jenny Inquisition. Jacob Krigstein's kidnap of Jenny in 'Authority' #13, intended to harness her power to "shape the century", indicates that (as was the case with Jenny Sparks) Quantum's attitudes and experience of life will correlate with those of the world during the 21st century.